(A new guide on ‘what to do if there is no zen group near you is now available on our Resources page). A great advantage of zazen is that it does not require much space to practice, although ideally where you choose should be quiet and unlikely to be disturbed. Keep the area clean and, if possible, reserve it only for your zazen practice. You may wish to install a small altar on which to place a statue of the Buddha or other inspirational figure, an incense holder, and perhaps a tiny vase for flowers, although none of these things is in any way essential. See setting up an altar for advice. The temperature should be comfortable – that is, warm in the winter and cool in the summer. The lighting should be normal, neither too dark nor too light. Natural lighting, when available, is the best. The essential idea is to maintain continuity so that whenever you enter the area set aside for zazen, the setting and the smell (if you use incense) are the same. In this way, you will begin to associate zazen practice with these surroundings and you will be able to settle down more quickly. It is best to practice zazen at a regular time or times every day. Early morning, noon, early evening and before going to be are the best times. If you can find time for only one session, a morning sitting is the one to choose. If you wish to sit twice a day, the morning and before bed time sittings are the best. To begin with, 15-20 minutes is enough. Build to up 30 minutes-1 hour, depending on your particular situation. There are a number of postures that can be used. You should try each of them to discover which suits you best. Persevere with one of the more stable postures even if it seems uncomfortable at first. Patience and practice are needed for good posture. The recommended postures are described here in increasing order of their stability, balance and conduciveness to good practice. It is perfectly acceptable to start with posture 1 and very few people can sit in posture 5. In all postures, the ideal is to sit in such a way that the body is perfectly upright, chin throat and navel. This is achieved by pushing the waist forward and the abdomen out. In this position the weight of the body is focused on the belly or lower abdomen. This area is the focus of zazen breathing and concentration. The eyes are half-open and focused on the ground about 3-6 feet (1-2 metres) in front of you. In some schools of Zen, it is also permitted to keep the eyes closed (as long as you do not doze off!). This posture is for people who find sitting cross legged uncomfortable. Sit on a stool or chair that is of a height that lets you set your feet firmly on the ground. If you are tall, adjust your height with a cushion set on the seat, or, if of a smaller build, some magacines on the floor beneath your feet. Set your back straight, shoulders down and head held upright but not stiff, more as though a thin line of cotton runs from your head to the ceiling. Rest your hands on your lap, right hand under left hand, palms turned upward. The thumbs touch at the tips and form a parallel line with your fingers. This is the easiest position for beginners. Straddle the cushion so that you are sitting on your knees, shins and insteps, and bottom. A triangle is formed by your knees and bottom. Head, shoulder, and hands are the same as in position 1. This is the Burmese position, a posture most popular with Western followers of Zen. The legs are crossed, but both feet are flat on the blanket. The bottom is situated on the first third to a half of the cushion. Both knees should be touching the blanket. If they are not, you may help get them down by putting a second cushion under your bottom, or you can place a small cushion under the knee or knees that stick up. It is important to be sitting on a firm base, formed by the triangle of your knees and bottom. Head, shoulders and hands are the same as in position 1. This is the half-lotus position. The left foot is under the right thigh and the right foot is on the left thigh, or vice versa. Both variations are equally good. This posture is quite difficult for the beginner. This is the full lotus position, in which the right foot rests on the left thigh and the left foot rests on the right thigh. The lotus is the best and strongest sitting position since it forms a perfect triangle between the knees and bottom and produces great stability. Unfortunately, lotus is also the most difficult posture to achieve and usually out of reach of the beginner and even many mature students. Do not worry if you cannot manage the lotus – most of us can’t either! Sit on the forward half of your zafu (the black, round cushion). Arrange your legs – full lotus, half lotus, Burmese,seiza or chair; choose the position you can sustain most comfortably and with stability. Centre your spine by swaying in decreasing arcs. Straighten and extend your spine and align your head (by “pushing up to the ceiling” and then relaxing). Origin of thrust is at the base of the spine. Belly and buttocks both protrude slightly. Head – should not tilt forward or lean to either side. Ears – should be parallel with shoulders. Tip of Nose – centred over navel. Chin – tucked in slightly. Eyes – neither fully opened nor fully closed, lowered to 45° angle; unfocused, “gazing” at the direction on the floor 3-4 feet (about 1 metre) in front. If you are closer than that to a wall, then “look through it,” at where the floor would be. Thus, blinking is minimised. Mouth – lips and teeth closed; place the tip of the tongue against the roof of the mouth, and evacuate the air so there is a slight vacuum. This inhibits salivation. Make sure your whole body is arranged the way you want it before beginning zazen. Keep as still as possible during zazen. When you finish zazen, remain quiet and calm initially and move only slowly out of the posture. After getting into a good posture, practice focusing your attention by counting breaths. To begin with, you can count the “in” breaths and the “out” breaths. Thus, as you inhale, count one; as you exhale, count two. The count should be inaudible. Do not try to control the breath. Let it be as it is. Just encourage it, even if it feels tense and shallow. As you are counting, you will inevitably have some thought or other. As soon as you notice you have stopped counting breaths, begin again at one. If you can reach ten without an interfering thought, go back to one and start again. Do the same if you find you have counted beyond ten. Do not be surprised if it takes a lot of practice before you can concentrate only on your breath. After some practice, you could start counting only the “out”-breaths. For most of us, many weeks, months or years will pass by before we can truly, consistently count to ten without a single distracting thought. This is quite natural since what we are doing is developing our ability just to be completely present in the moment. For most of us, the feeling of having nothing to do is uncomfortable, and, as we have discussed, our minds will try to fill the gap with an amazing variety of thoughts. Gradually, we learn to sit for longer and longer periods. Do not see this practice of counting breaths as something that is easy or as one that you wish to move on from quickly. Sitting in zazen and counting breaths is a complete practice and one that deserves our full attention if we are not to waste our time on the cushion. Loose clothing is essential to let you sit and breathe freely. Dark clothing, black preferably, is recommended, particularly if you sit with a Zen group. Bright colours may distract the concentration of others. Whatever clothes you wear, they should be clean, fresh and comfortable. You will need a firm cushion which should be placed on a flat blanket if the floor is hard, or, if not, directly on the carpet. 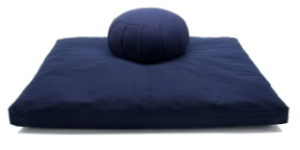 In Zen monasteries and Zen sitting groups, monks and lay people usually sit on a small black round cushion called a zafu which is placed on a black mat called a zabuton (about 3 feet / 1 metre square). Zafus are approximately 15 inches (38 centimetres) in diameter and 2-4 inches (5-10 centimetres) thick. They are normally packed tight with kapok or buckwheat hulls. Some people use two zafus or make one higher by placing another cushion or folded blanket underneath it.